The project includes 2 new bus lines and an unrestricted transit pass program for USM students and staff. 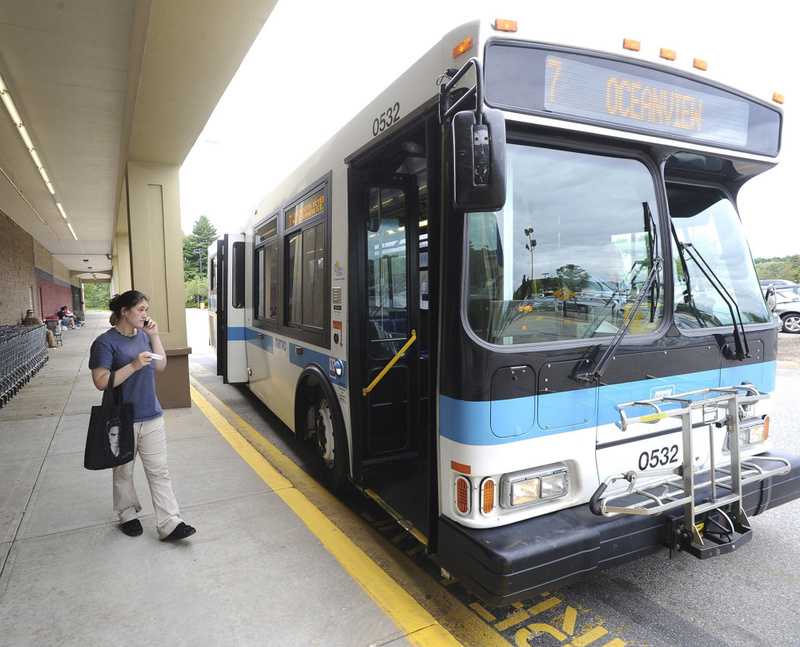 A major public transportation expansion planned next year will connect Gorham to downtown Portland and give regional Metro transit passes to all students, faculty and staff from University of Southern Maine. The $4.5 million project will extend a limited stop, high-speed transit line between Gorham and downtown Portland and add a new bus line connecting Westbrook and the Maine Mall. The expansion could add 400,000-500,000 riders a year, a nearly 25 percent increase over current ridership, according to Metro estimates. The Transit West Project is “the most significant public transportation expansion” in Maine since the Downeaster passenger rail launched in 2001, said Metro General Manager Greg Jordan. Metro plans to launch the new bus lines and university pass in August 2018. An advisory committee will begin finalizing bus schedules and stops this fall. The centerpiece of the project is the Husky Line, a transit bus between USM’s Gorham campus and Portland. Scheduled stops include Gorham Village, downtown Westbrook and the USM Portland campus. The Husky Line will run in tandem with the Route 4 bus between Westbrook and Portland, one of the busiest routes in the Metro network. Adding the Husky Line is expected to relieve congestion and bring the wait time for buses down from 30 minutes to 15 minutes, Jordan said. The USM U-pass, an unlimited Metro pass for all students, faculty and staff, is the backbone of the new service. The school currently contracts with a private bus company to shuttle students between the Portland and Gorham campuses. With an unrestricted transit pass, the school’s 8,000 students will have more options to get to work, school and home, said USM President Glenn Cummings. Many students live in Westbrook and will benefit from direct access home. Most work at least part time and may benefit from a transportation network stretching from Gorham to Brunswick, Cummings said. The program will also reduce the school’s carbon footprint and cut down on the amount of parking it needs, he added. The U-pass program is similar to the transit pass program Metro designed for Portland high school students in 2015. The Metro pass will cost USM approximately $400,000 a year, the same it pays for the student shuttle, according to Buster Neel, interim chief business officer at USM. The Husky Line will have more frequent rides and better weekend service, but will take about five minutes longer and will not have soft seats like the hired coaches. “Those were the only two negatives we could come up with,” Neel said. 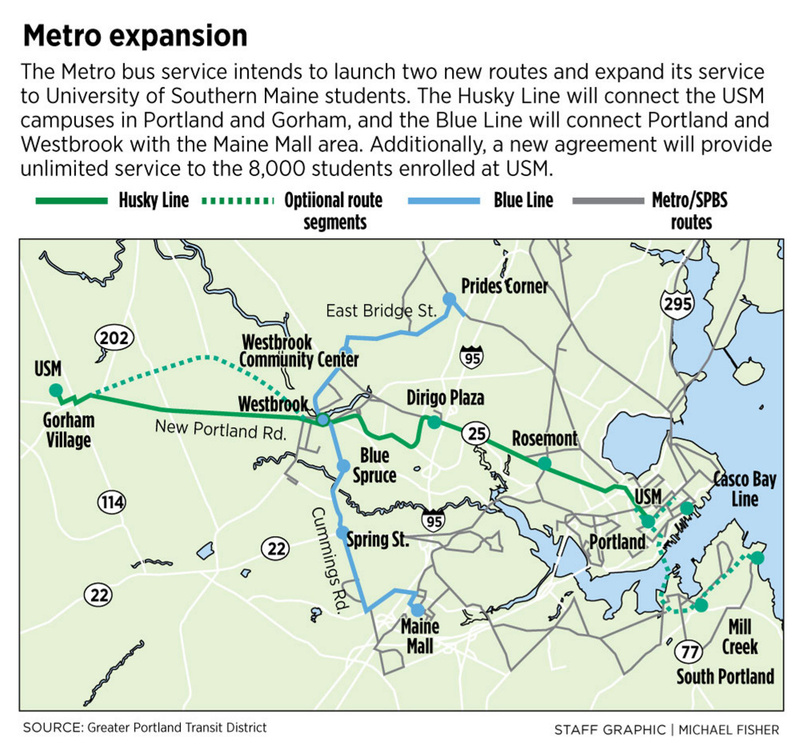 USM students will give the Gorham-Portland service a built-in ridership, but Metro hopes it will catch on with residents. New public transportation could help alleviate traffic congestion west of Portland, especially if Metro eventually makes a commuter park-and-ride to access the new line, Jordan said. “We hope this will attract people who live in Gorham and commute through Gorham,” he said. Demand for public transportation in Westbrook is driving Metro to restructure Route 4 and add a new service, the Blue Line, that will run from Pride’s Corner through downtown Westbrook to the Maine Mall. The current Westbrook Metro route is convoluted and doesn’t have stops at important sites like the city’s community center, Jordan said. There is also no direct route from downtown Westbrook to the Maine Mall area, about 5 miles away. “Right now, you are taking two buses and it could take up to two hours,” Jordan said. The ride will take half an hour with the new route, he estimated. The Blue Line was planned to accommodate Westbrook’s growth of residential housing and will include a stop near Blue Spruce Farm, a new housing development along the route, Jordan said. Public transit could also help ease concerns about traffic congestion due to new development, he added. “They need more for their community to grow in a sustainable way,” Jordan said. Federal funding will cover 80 percent of the $4 million-$4.5 million startup costs, with local contributions covering the remainder. Gorham is expected to pay $35,000, Westbrook between $300,000 and $330,000, and Portland up to $85,000 for the new service, according to Metro. Those estimates could change depending on final levels of service, Jordan said. Annual operating costs will be $1.6 million-$1.7 million, paid for with federal air quality funding, local contributions, and revenue from fares and advertising. Metro, which covers Portland, Westbrook and Falmouth, has expanded steadily in the last few years, adding a commuter service to Yarmouth, Freeport and Brunswick and growing ridership through school programs as well as installing new bus shelters and giving riders online transit-tracking tools. In 2016, Metro had approximately 1.8 million riders.